London is full of excitement, arts and culture, not to mention the shopping! The best part about this diverse city is that each visitor can choose to create their own experience, whether you wish to simply relax and stroll through the city streets or explore the museums, art galleries, shopping, world-class cuisine, historic buildings or beautiful parks. With elegant Mayfair to the west and creative Soho to the east, Café Royal hotel is perfectly positioned within walking distance of London’s finest shopping streets, tourist attractions and theatre land. 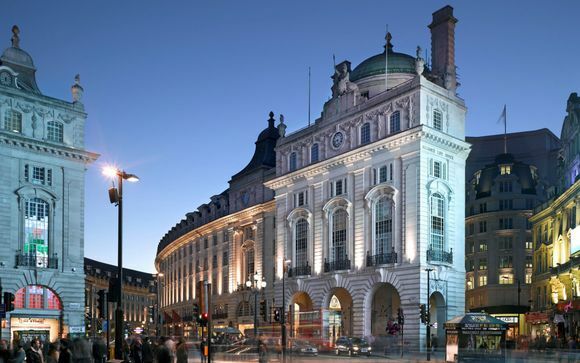 Ideally located on Regent Street this stunning 5-Star hotel is situated in the beating heart of the West End. Also on the doorstep are the famous shopping destinations; Bond Street, Mount Street, Jermyn Street and the tailors of Savile Row. Below Piccadilly Circus are the exclusive clubs and art galleries of historic St James' with The Royal Academy and the National Gallery all within walking distance. The historic Café Royal is outstandingly designed and well appointed. True to its original glamorous spirit, Café Royal has reopened as a luxury 5-star hotel in the heart of central London. Combining architectural heritage with contemporary design, Café Royal hotel features 160 rooms and suites and an array of bars and restaurants. The serene new rooms and suites have been created in a fashionable style characterised by a refined simplicity touched with grand classical features in stone and copper. This offer is based on a stay in either a Portland Room or Portland Deluxe Room. Moving seamlessly from historic spaces, bedrooms are contemporary yet serene, designed with meticulous detail. 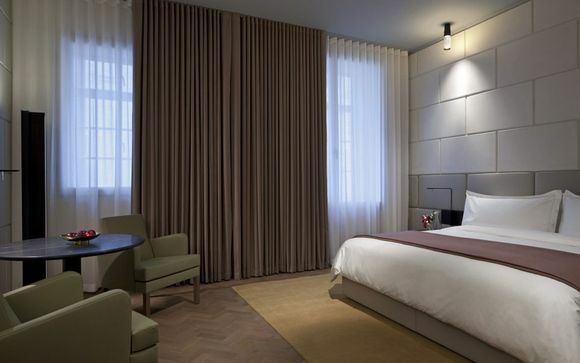 Portland Room - Created in rusticated Portland Stone, to mirror the architecture seen on the handsome Regent Street façade, the serene Portland Rooms are some of the largest in London. Entrance is by a generous lobby with double doors leading onto the stunning Carrara marble bathrooms, featuring rainfall showersa and mirror TV screens. They feature 35 sqm of space. Portland Deluxe Room - Portland Deluxe Rooms include the same features as regular Portland Rooms, yet come with a separate bath as well as more space (40 sqm). They can also accommodate an extra baby or child, if needed. This offer is based on a bed and breakfast stay which includes an English breakfast. For restaurant reservations contact restaurants@hotelcaferoyal.com or call 020 7406 3310. Oscar Wilde Bar - The iconic Oscar Wilde Bar (originally established in 1865) has been exquisitely restored to its original Louis XVI detailing and is now the place to enjoy Champagne, cocktails and a light menu. Nestled between the elegance of Mayfair and the creativity of Soho, the Oscar Wilde is where great minds came together to change the world. It is in this very room that Oscar Wilde fell in love with Lord Alfred Douglas, Aubrey Beardsley debated with Whistler, David Bowie retired Ziggy Stardust and Mick Jagger, the Beatles and Elizabeth Taylor danced the night away. Ten Room - The Ten Room offers British informal all-day dining in the heart of Café Royal hotel and in the centre of London's West End. The revival of the Ten Room signals the resurgence of one of London’s most renowned dining rooms. Echoing the heritage of this iconic landmark, this elegant space has been both sensitively restored to feature original details and modernised to appeal to twenty-first century sensibilities. Mirroring the transitional aesthetic, from famed past to cosmopolitan present, the Ten Room offers a modern take on British dishes with genuine new flavours and styles. Overseen by executive chef, Andrew Turner, the menu marries the traditional with the contemporary. The Green Bar - Inspired by the Café Royal Cocktail Book compiled in 1937, the Green Bar at Café Royal is a vibrant cocktail destination for contemporary Londoners and hotel guests. Celebrating the diverse history of the location, the cocktail list features heritage cocktails alongside classic concoctions and a selection of small dining plates. "Absinthe at the Bar" is an iconic offering from the Green Bar. Expert bartenders mix cocktails and serve shots straight up traditionally, from the steady drizzle of the absinthe fountain. As the spirit of Café Royal is revived, so too is the ritual of drinking Absinthe, the favoured tipple of the bohemian intellects who notoriously frequented Café Royal throughout its history. The Domino - The Domino is the new, refined dining experience completing Hotel Café Royal’s return to London's vibrant social scene. Revivifying the glamour of entertaining, members of The Club at Café Royal and hotel guests will dine under an elegant canopy of intricate and beautifully restored cartouches, like the icons of London society before them. Café Royal's Wellbeing Centre provides a personal and intimate holistic experience. It has a large lap pool and four different areas, corresponding to the four natural elements: spa/water, gym/fire, yoga/air and organic bar/earth. 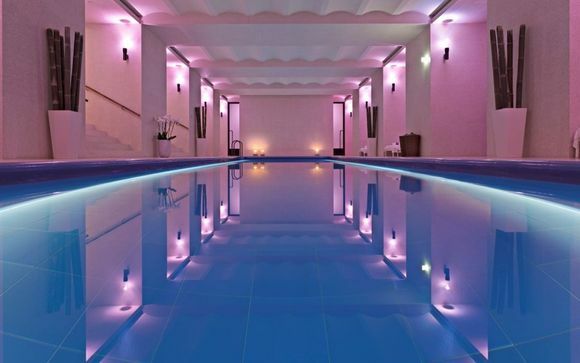 The spa offers a variety of Watsu hydro-experiences, a private and public Hammam and signature Akasha treatments. Moods are enhanced by restorative music, aromas and gentle lighting. The gym has the most advanced fitness equipment, including Kinesis machines. There will be a spacious aerobics studio and a private training room. Yoga, Tai-Chi and Pilates are offered in the calming area, with bespoke classes. The all-organic lounge and bar area offers a healthy, nourishing assortment of snacks and juices. Café Royal has its own airport transfer service. Café Royal is less than a minute’s walk from Piccadilly Circus station served by the Bakerloo and Piccadilly lines. Paddington Station is 15 minutes from Café Royal by car or Underground. For services to London Heathrow. Victoria Station is 15 minutes by car or Underground. For services to London Gatwick. Euston is 20 minutes from Café Royal by car or Underground. King’s Cross is 20 minutes from Café Royal by car or Underground. Waterloo is 20 minutes from Café Royal by car or Underground. St Pancras Station is 20 minutes from Café Royal by car or Underground. For Eurostar services to the Continent.